KIEV, Ukraine -- Ukraine will likely undergo major political changes in 2016, during which the government will potentially replace Prime Minister Arseniy Yatsenyuk. Ukrainian Prime Minister Arseniy Yatsenyuk delivers a speech in Kiev on Dec. 29, 2015. To avoid holding early parliamentary elections, Ukrainian President Petro Poroshenko will attempt to back Yatsenyuk, but smaller parties within the ruling coalition will seek the premier's ouster. Regardless of the prime minister's fate, a substantial Cabinet reshuffle is all but inevitable. These political disruptions could impede negotiations between Russia and the West over the conflict in eastern Ukraine. The conflict in eastern Ukraine may be simmering, but political infighting in Kiev is heating up. 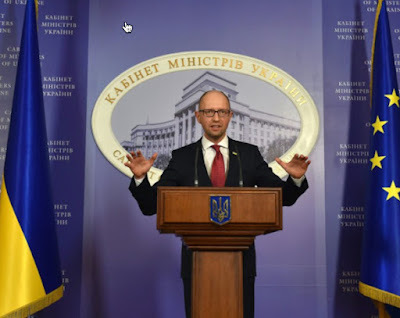 On Jan. 31, the Self Reliance Party of Ukraine's ruling coalition called for a no-confidence vote against Prime Minister Arseniy Yatsenyuk in the Ukrainian parliament, threatening to leave the coalition if the vote was not held. The same day, parliament Chairman Volodymyr Groysman announced that the legislature would consider a report on the work of the Cabinet from Feb. 16 to Feb. 19, which could precede a no-confidence vote. But whether the prime minister retains his position is a moot point. Kiev will need to make changes in its government to retain any semblance of stability, and the upheaval will complicate the country's position in the broader competition between Russia and the West. After the Euromaidan uprising in February 2014, Yatsenyuk and President Petro Poroshenko emerged from the chaos as Ukraine's primary political leaders with the strongest mandate to lead the country. Their respective parties won the most seats in the October 2014 parliamentary elections, with the Petro Poroshenko Bloc winning 132 seats and Yatsenyuk's People's Front gaining 82 seats in the 450-seat parliament. They subsequently formed a broad-based coalition of pro-West parties that included the Self Reliance, Radical and Fatherland parties to secure a solid 288-seat majority. However, since then the war in eastern Ukraine, a major economic contraction and painful austerity measures have led many in the public and in the government to become dissatisfied with Kiev. The slow pace and ineffectiveness of reforms have instigated periodic protests and have diminished the government's popularity. Consequently, smaller parties in the ruling coalition have begun to distance themselves from the embattled prime minister. In September 2015, the Radical Party quit the coalition over controversial constitutional amendments related to the decentralization of the Ukrainian state, bringing the coalition's majority down to 266 seats. The Self Reliance and Fatherland parties recently indicated that they might follow the Radical Party in leaving the ruling coalition as well. And in October 2015, Yatsenyuk's People's Front did not even participate in local elections because polls indicated that the party had less than 5 percent of the vote — a dramatic decline since its strong performance in parliamentary elections a year earlier. Sensing the need for change, Yuri Lutsenko, the leader of the Petro Poroshenko Bloc in parliament, suggested on Jan. 31 that the Ukrainian Cabinet be completely overhauled. However, Lutsenko advocated that Yatsenyuk stay on as prime minister, arguing that his resignation could trigger early elections and would require precious financial and political resources at an already sensitive and difficult time. It is in Poroshenko's interest to keep Yatsenyuk as prime minister despite his slumping popularity, since there is no credible alternative that would preserve the coalition. The Ukrainian government will have to make changes to survive, regardless. The question is whether Yatsenyuk will be able to weather those changes. Of course, one factor favoring Yatsenyuk is that the United States, a major supporter of the pro-West government, would rather the premier stay in power. Washington views Poroshenko and Yatsenyuk as the most effective team and those with the best chance of stabilizing Ukraine under the current circumstances. Both are bulwarks against Russian influence in the country, and both represent Ukraine's best hope for implementing reforms to secure financial assistance from institutions such as the International Monetary Fund. In a show of good will, U.S. Vice President Joe Biden even visited Kiev in December 2015 to bolster support for the Ukrainian government, though he also warned against disunity and growing corruption. The amount of political infighting that ultimately occurs will have domestic consequences, of course, but it will also influence Ukraine's relationship and negotiations with Russia. Any early elections could derail the Minsk peace talks, which have recently seen some positive, albeit tenuous, progress. Diplomatic breakdowns, in turn, could cause fighting to flare up on the front lines and could delay the security components of the Minsk protocols. So while eastern Ukraine is a key arena in the wider standoff between Russia and the West, politics in Kiev will increasingly shape the conflict throughout 2016.